Photo via Great British Bake Off/Facebook. A very dishy report in a British tabloid alleges that things are going poorly behind the scenes at the jam-smeared zombie that once was beloved franchise Bake Off. Tea time! 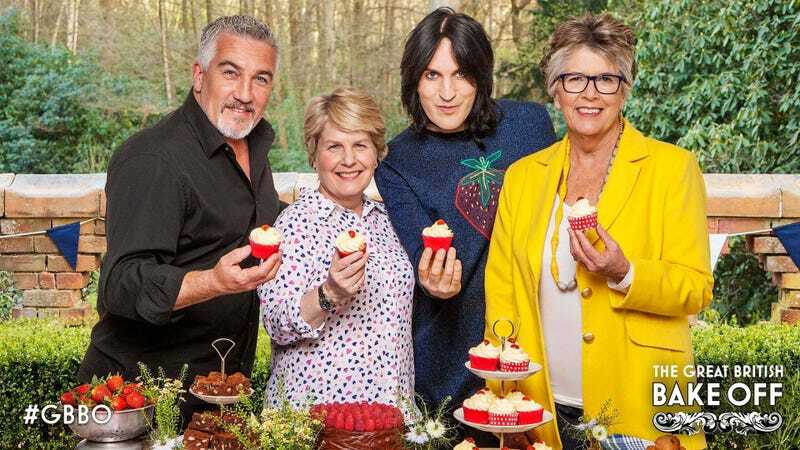 The Daily Mail reports that in the wake of these allegations, Defiant Paul Hollywood shares cosy snap with new Great British Bake Off co-judge Prue Leith... amid reports she ‘can’t stand’ the show veteran.” Yes, they look like fast friends. Oh, to be in a group chat with Mel, Sue, and Mary.